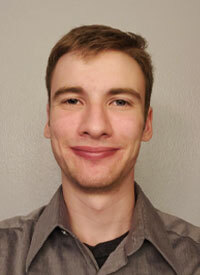 Justin is currently a Sophomore at Millikin University double-majoring in Physics and Mathematics. He is very excited and passionate about Physics and Astronomy and hopes to study as an Astrophysicist one day. He is an excellent student, and already by the end of Freshman year, he has both three semesters of calculus and four semesters of physics classes completed. He is also a part of the Millikin University's Honors Program. Justin currently has a job through the Department of Physics and Astronomy at Millikin University as the Student Assistant at the Requarth Observatory and as a Teaching Assistant for the Planets and Stars Astronomy Lab. As the Student Assistant at the Requarth Observatory, Justin helps maintain a variety of 8" telescopes, a 12' telescope and a large 20" telescope. He also runs weekly Public Observation Nights at the Requarth Observatory where the campus and surrounding community is welcome to come to the Observatory and use the telescopes and have an opportunity to about space. Furthermore, Justin is a part of a small group of students with his Physics professor studying dark matter. What I like most about SPS is its emphasis on engagement within the physics community through research, education, and outreach while also embracing diversity and inclusion.